Wrasse are a family (Labridae) of sea fish species which inhabit rocky reefs and kelp beds in Scotland’s coastal waters. They feed upon crustacea and molluscs and play a vital role in the wild in controlling parasites which predate upon other fish (including commercial species) or on habitat-forming flora such as kelp. 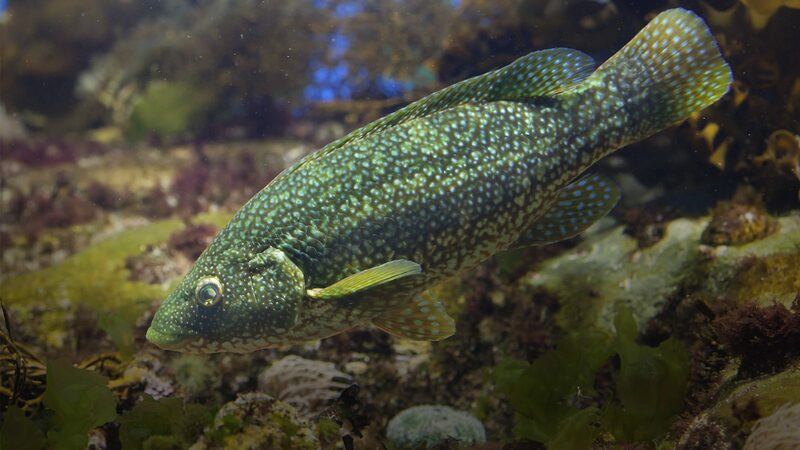 In addition to their important ecological function, wrasse are also of high socio-economic importance, particularly to recreational divers and sea anglers, given their striking appearance. As concerns have grown about the use of Emamectin Benzoate and other anti-parasitic chemical treatments to treat sea lice on salmon in Scottish salmon farms, industry has increasingly turned to the use of “cleaner fish” as a substitute for these chemicals. Five wrasse species are trapped live in creels for this purpose, but there is increasing evidence that this fishery is in turn unsustainable. Available landings data suggest that localised wrasse populations frequently collapse following the commencement of commercial fisheries. This is consistent with the observed practice of Scottish wrasse fishermen, who alter their grounds from one year to the next – which is understood to be a response to local stocks being reduced to a level where they can no longer be economically exploited. Observations by recreational and professional divers, sea anglers and initial scientific analysis of local wrasse population declines following the commencement of wrasse fishing reinforces this analysis. Wrasse are unusually vulnerable to over-exploitation and localised depletion, on account of their unique life cycle. They hibernate in winter, make nests which they guard to protect their eggs, are slow growing (they can live for over 20 years) and have a tendency to change gender as they mature. So removing large individuals profoundly upsets and threatens reproductive success. And being territorial, they have extremely limited home ranges. So when wrasse are removed from an area, they do not readily recolonise it. Cuckoo Wrasse. Credit: Howard Wood. SIFT is not opposed to the use of cleaner fish in aquaculture, but this should require either the responsible use of farmed wrasse, or a genuinely sustainable and properly regulated fishery based on sound science. The English Inshore Fisheries and Conservation Authorities have set a good example here: and have brought in effectively monitored and enforced mandatory measures to collect accurate data, and implement quotas, spatial management and temporal restrictions. Scotland can and should follow a similar approach. Until such measures have been adopted, there should be a moratorium on the commercial wild fishery for all wrasse species. SIFT has produced a briefing for MSPs outlining the issues and is campaigning for regulation.